Often the difference between a good smile and a great smile is the whiteness of the teeth. Typical lifestyle choices as well as the aging process stain and darken your teeth. Things you do on a regular basis such as drinking coffee, tea, cola and red wine or smoking can contribute to staining your teeth. New whitening agents can remove these stains without harming your teeth. When you meet people for the first time, it’s your smile that they will remember. A whiter, brighter smile is beautiful and can help make a better impression while making you feel better about yourself. Whitening your teeth is one of the easiest things that can be done to brighten up your smile and improve your appearance. While you can get over-the-counter whitening kits, they are rarely as effective as professional whitening procedures. Because over-the-counter trays are not custom fitted by a professional and the whitening agent may leak out and irritate your gums, the kits do not work either as quickly or effectively to whiten your teeth. Will Tooth Whitening Work For You? Whitening isn’t for everybody. If it’s determined that you’re a good candidate for whitening, the best option for your situation will be prescribed, and the progress will be closely monitored to determine if any adverse reactions do occur. Even with today’s advanced whitening techniques, everyone’s teeth will not whiten with the same results. Yellow-, brown- or orange-toned stains will generally bleach out quite well, whereas grayed teeth, or teeth stained by tetracycline use, may not bleach satisfactorily. Your situation will be carefully evaluated, and you will be advised accordingly. If tooth bleaching isn’t for you, don’t give up on having whiter, brighter teeth! Porcelain veneers or dental bonding could be the perfect solution for you. 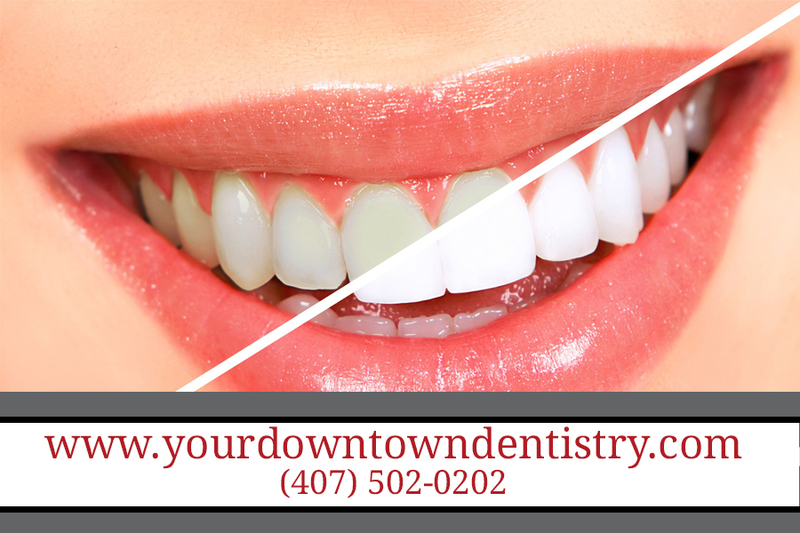 At Your Downtown Dentistry, we offer general and cosmetic dentistry services, including teeth whitening, designed to help you obtain and maintain your most beautiful, healthy smile.